If you follow The Pioneer Women then you may have already heard of her Knock You Naked Brownies. A couple weeks ago I stumbled on a pin for Knock You Naked Cookie Bars. The picture had me hooked. I revamped her recipe and made it with my all time favorite healthy cookie recipe rather than buying pre-made cookie dough. I ate half the pan so to say I wasn't disappointed by the results is an understatement. I adapted this recipe comes from One Smart Cookie by Julie Van Rosendaal. She brilliantly makes the cookies, brownies, etc. that we all love and makes them lower in fat and healthier. If I am going to make a cookie for myself or for others 9 times out of 10 it will be this cookie (Granted, as long as it is not fall because then with the weather changing and pumpkins being on sale, the Great Pumpkin Cookie just feels right). Let me tell you this Oatmeal Raisin Chocolate Chip Cookie recipe is a hit every time! I don't normally make these cookies into shapes but it was Hubby's birthday awhile back, so I felt that occasion called for something a little more special. You can make the cookies and stop with just the dough, you won't regret it. You can continue on to bake the cookies and you also won't regret it. Or you can take these cookies to a whole new level that will knock your socks off. The caramelly goodness in the middle makes me want to crawl in between the cookie layers and live there. No that's not weird. What would be weird though is if you didn't run to your kitchen right now and make these. Bakers Note: When rolling out the top layer I cut it in half so it was easier to transfer from the counter to the pan and then just slightly pinched the two pieces together in the pan to form one piece. Where you can only eat Knock You Naked Brownies in the privacy of your own home you can eat Knock Your Socks Off Cookie Bars any where you like. So throw on a cute pair of socks, take some of these bars to the park, and get ready to go barefoot in the grass. Preheat oven to 350 F. In a large bowl beat butter and brown sugar together until it looks like wet sand. Add the egg whites and vanilla and beat until smooth. In a medium bowl, whisk together flour, oats, baking soda, salt, and cinnamon. Add the dry ingredients to the sugar mixture, stirring by hand until almost combined. Add your chocolate chips and raisins and continue to stir by hand until just blended. Lightly grease an 8X8 pan. Take half of the cookie dough and roll it out on the counter, transfer to the pan and bake 8 - 10 minutes. While your cookies are baking melt your caramels and evaporated milk together in a double boiler. 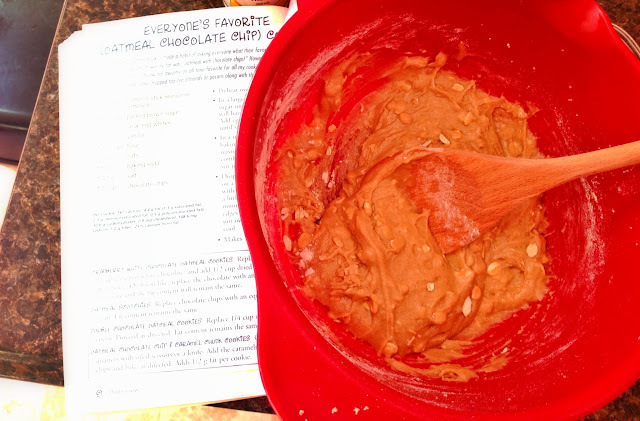 When the caramels are melted, take the pan off the heat, and stir in peanut butter. Spread the caramelly goodness over the cookie base and sprinkle the chocolate chips on top. Roll out your top layer of dough and transfer to the pan. Bake another 10 minutes or until lightly browned on top. I'm totally going to use this for V-Day. :) Thanks for posting.